A patient receives new antiviral drugs for hepatitis C in Georgia. 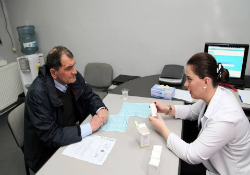 In April 2015, Georgia launched a hepatitis C elimination programme by making the new curative treatment available to people infected with hepatitis C virus (HCV) and suffering from severe liver disease. As the new antiviral drugs for hepatitis C, known as oral "directly acting antiviral agents" (DAAs), are not affordable by most people, the plan is to make discounted HCV diagnostics available to all and to build capacity to diagnose and treat all Georgians infected with HCV. A combination of strong political will, public support and experience gained in HIV prevention and control led to this new programme. The Ministry of Labour, Health and Social Affairs is working with a pharmaceutical manufacturer to provide an initial 5000 courses of DAAs as the first part of the programme, followed by 20 000 treatment courses annually free of charge. As of 22 July this year, 2042 people with HCV had begun treatment, out of over 7600 who presented for evaluation for the treatment in the first months of the programme. Certain factors make hepatitis C a strong candidate for elimination: humans are the only natural host for HCV, and effective treatment, diagnostics and preventive measures are available. Yet, significant challenges remain, including the asymptomatic, chronic nature of HCV, which results in delayed diagnosis, transmission among hard-to-reach populations (such as those who inject drugs) with potential re-infection, and a large global burden of the disease, including in areas with limited access to effective, affordable diagnostics and treatment. To address these challenges, Georgia will prepare a comprehensive elimination plan that includes advocacy and communication, surveillance (including high-quality diagnostics) and prevention (e.g. infection control, blood safety and harm reduction). Additionally, the Ministry has begun broader HCV control activities, including a campaign to raise awareness, provision of free HCV testing to detect infection in people who are unaware of their infection status and improved infection control practices. The National Center for Disease Control and Public Health (NCDC) together with the US Centers for Disease Control and Prevention (CDC) is implementing a sero-survey on hepatitis B and C in Georgia. A population-based survey with 7000 randomised selected participants will be finished by the middle of August 2015. Georgia's new programme can serve as model for similar efforts in other parts of the world. According to a 2002 survey of the general population of Tbilisi, Georgia's capital and largest city, 6.7% of the population had antibodies to HCV. The prevalence of HCV infection is high among people in prison (50%), people who inject drugs (50–70%) and people infected with HIV (47%).